Our applications engineers have a wealth of experience in the intricacies of our customer’s parts and the most advanced methodologies to produce them. Whether it’s a complex part that has been in existence for decades or a totally new design, our applications engineering staff has the know-how to get the job done. 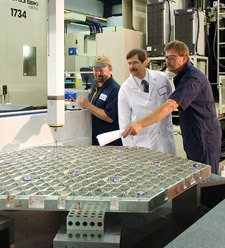 Teaming with our product engineers, they have resolved sophisticated machining challenges that wouldn’t be approached by any other machine tool manufacturer.